I belong to an inspiring and motivating group of educators called #sunchatbloggers. The other day a member of the group, Joanne Ireland, wrote about five strategies for student engagement, and we decided it would be fun to do a series of “five strategies” posts. I’m obsessed with anything that allows teachers to give student’s control of their own learning. Too often, the dialogue in classrooms seems to go from teacher-to-student and student-to-teacher, with the teacher remaining at the center of most discussions. Students listen to teachers for information and answer questions when asked, but tend to tune out when their peers are talking. Yet we all know that when they actively listen to one another, students learn so much more than when they listen only to teachers. Triad questioning method. In this technique, students build on each other’s responses, which encourages them to pay attention to their peers’ ideas. The teacher will ask a question, then call on a student to respond. Without reacting to the first student’s response, the teacher then asks a second student if they agree or disagree with student #1 and why. After that, the teacher calls on a third student, asking them to add more information. Finally, the teacher goes back to the first student for a final comment or summary of what was discussed. This strategy makes students listen to one another and puts the teacher in the position of facilitating, rather than being the “sage on stage.” It also allows teachers to call on shyer students for the second or third answer, since responding to an idea can be easier for these students than stating a first opinion. Lincoln’s history class’ interactive wall. 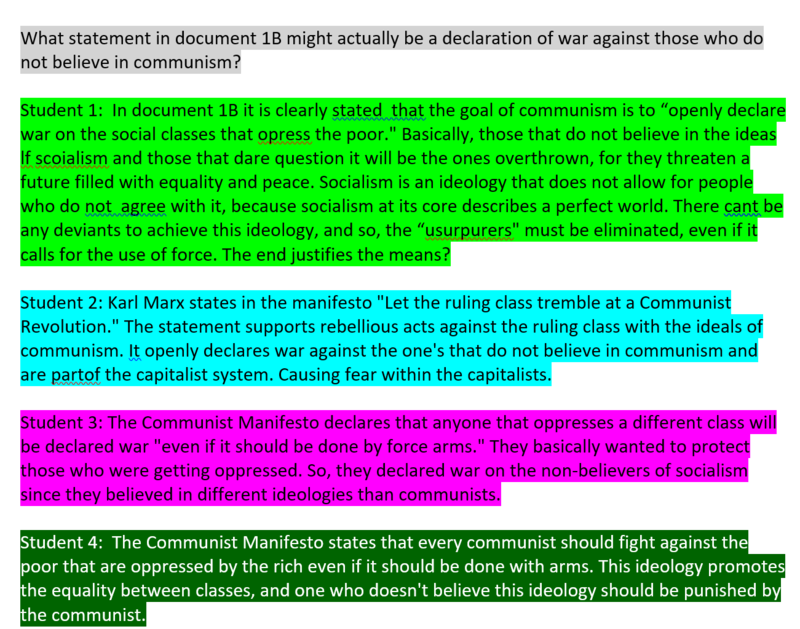 Students generate questions based on a primary document. Interactive walls. 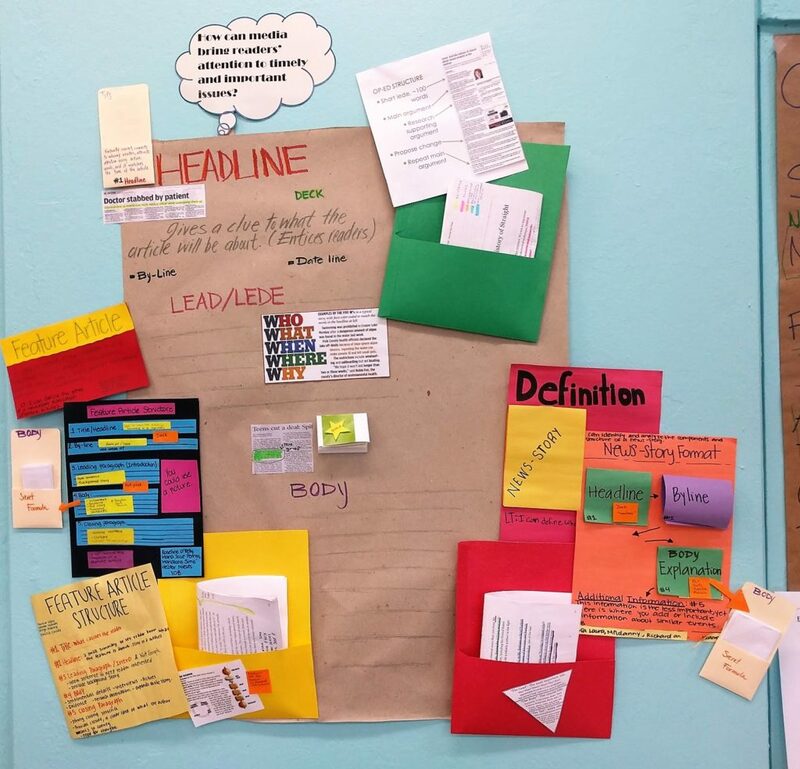 To craft an interactive wall, teachers start by putting primary documents, newspaper articles, essays, or student-made mini-lessons on their classroom walls. Students then look at the documents and post reflections or questions around them, often building on each other’s comments or making connections between comments. The walls stay up and change constantly throughout the unit as students add to them when they’re working independently in class. 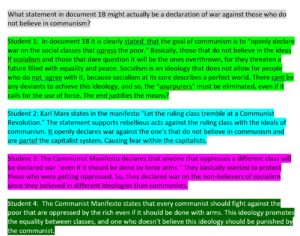 Students can refer to information on the walls in class discussions, debates, and written work. They learn from each other and their understanding deepens as they respond to their classmates’ thoughts and questions. Protocols for peer feedback. – This is a wonderful way to help students learn to critique each other’s work. Using a protocol, three or four students examine another student’s writing or project and give him or her feedback on it. Generally speaking, peer reviews don’t seem to work very well in class, since some students don’t really know how to give strong feedback or worry about offending their peers. But in this format, students build on each other’s ideas, and every student that asks for feedback comes away with plenty of ideas to work with. At the same time, students listen to each other’s feedback and slowly become stronger at critiquing work (both others’ and their own). Think-Pair-Share. This tried-and-true technique remains one of my favourites. Have students think individually about an answer to a teacher’s question, then discuss their ideas with a peer before sharing with the class. This adds in wait time, which gives students time to reflect on their ideas, allowing them to give deeper answers and to build on one another’s ideas. I’m going to cheat here and post a link to another educator’s five techniques blog post: for more information, check out Elizabeth Mulvahill’s 5 Fun Alternatives to Think-Pair-Share. allows students to have online discussions that can be tracked and saved. For example, a teacher can share a document for students to read, then ask them a number of questions that serve as jumping-off points for discussion. The great thing about TitanPad is that many of our more introverted or quiet students really seem to find their voice when they can write, instead of having to speak up in class. Teachers can then look back on the discussion, take note of misconceptions or misunderstandings, and address them in future classes. One thing to note is that these techniques will only work if teachers’ questions are fairly deep and lead to good discussions. It’s hard to use a strategy like triad questioning if there’s only one simple, correct answer. But with strong questions and the use of these techniques, we teach students to take control of their own learning. I’m sure there are oodles of other techniques out there to help students connect and learn from each other, and I’d love to hear them. Please share your favorites in the comments below! Gillian, we’ve found that Titan Pad is a great way to give voice to the students who are afraid to speak up in class. Once they find that their comments are accepted and that others respond to them, they often find the courage to speak up in class. I love how these methods allow for students to reflect beyond their initial responses to questions. I look forward to incorporating the triad questioning method and think pair share into my classes. Thanks for posting. Let me know how they work for you Anthony. They’re simple methods that truly change the classroom atmosphere. Triads sound like effective way to leverage smaller groups, invite more voices, and cultivate depth of knowledge. Look: another triad! Brian, I love triad questioning because it’s simple but effective. At first when the teacher calls on student #2 the response tends to be “huh?” or confused silence because they weren’t paying attention to other students’ responses. Once they get used to it, students begin truly listening to each other and responses become much deeper. Exactly Aubrey! The person doing the talking is the one doing most of the learning…and, unfortunately, that’s often the teacher. Thanks so much for sharing such engaging ways for students to really dig in and engage in productive conversations. I think it was particularly helpful how you linked resources for even more information. I will be pinning and sharing your post with our teachers. 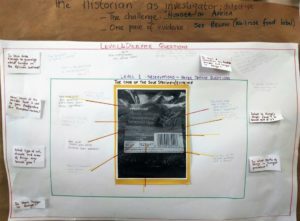 I am particularly tickled with the idea of an interactive wall…we’ve done a lot in the past with anchor charts and such…what a fabulous way to kick them up a notch. Also….I had not heard of Titan Pad. This sounds like it could be quite powerful for our quieter students. Thanks for your feedback Joanne! 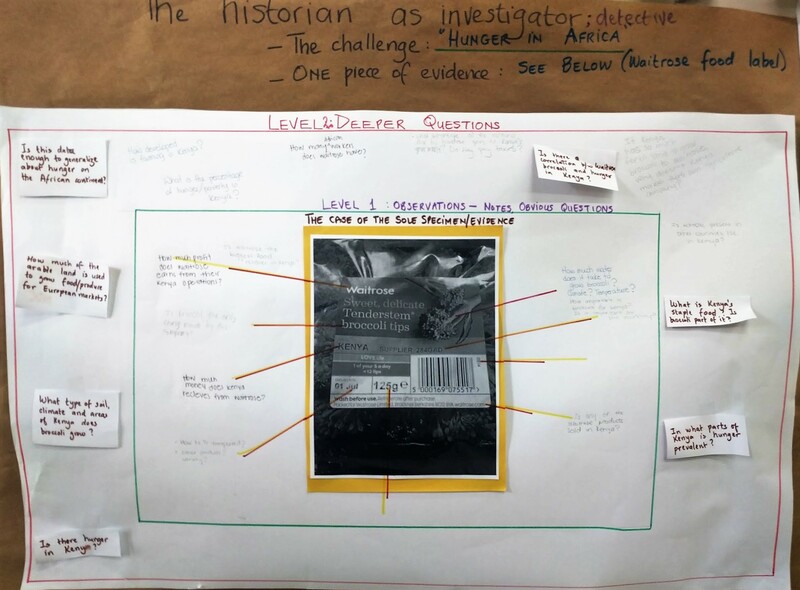 Interactive walls were developed by our secondary history teacher and now several other teachers use them as well. They really make the classroom come alive for our students. If you try them, I’d love to see pictures!